Normally I want to focus this site’s book reviews on the best eco-themed stories–ones I encourage you to borrow from the library and share with your infant, toddler or child. But I felt compelled to warn you of Digger, Dozer, Dumper, as it is not just one more book celebrating construction equipment–which a year after my son became fascinated with these metal beasts is easier to understand–but actually makes the slaughter and displacement of countless species look exciting! Every page is a tribute to a certain piece of heavy machinery, from steam rollers, forklifts, and excavators to snow plows, street sweepers, and fire trucks. All good fun? Not when many pictures include actual images of ecocide in one form or another. The street sweeper sweeps away a squirrel, the steam roller is poised to squish a turtle, the bulldozer knocks over trees while birds fly away, the skid-steer loader digs up a frog, and the backhoe collapses a mole’s home. It’s so over-the-top I want to believe the author is trying to actually drum up sympathy for nature’s creatures, but in reality I think she was just trying to be cute. All the while, little boys and little girls–often with their dogs in tow–are the purveyors of this destruction, which is at least accurate. Consumer-man and their out-of-control pet population are certainly to blame for the rapid decline of the Earth. Anyway, as a tribute I’ve made a massacre montage of some of the most graphic scenes of the book. Sensitive viewers should scroll no further, and should certainly keep this book off their to-read list. 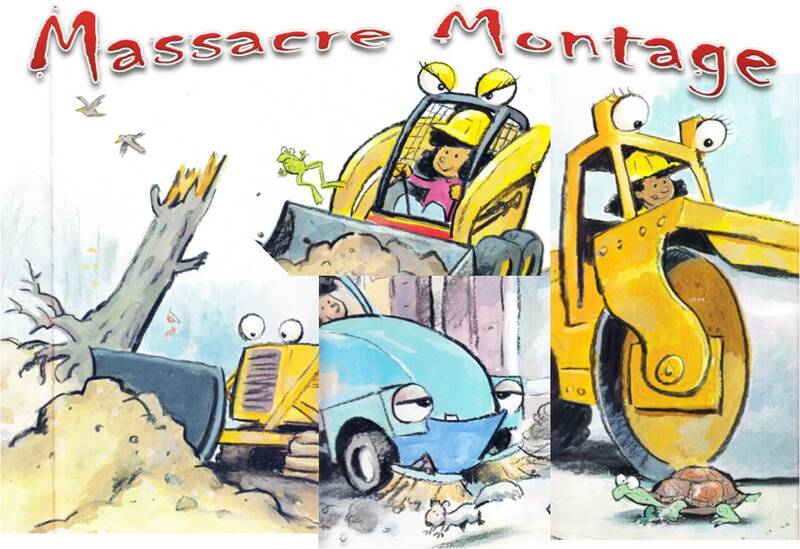 Some of the graphic images of ecocide in Digger, Dozer, Dumper.